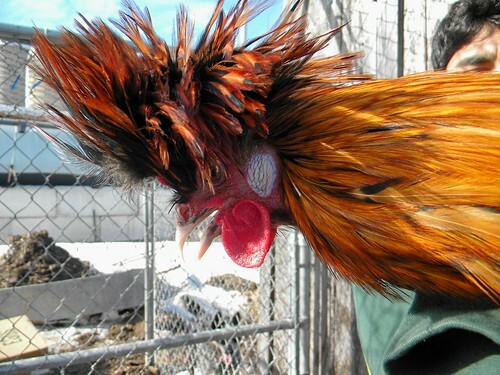 Day 116, March 13: This is one of Greg’s new roosters. He’s a Polish breed and always looks like he’s having a bad hair day. Day 117: Biology class again. 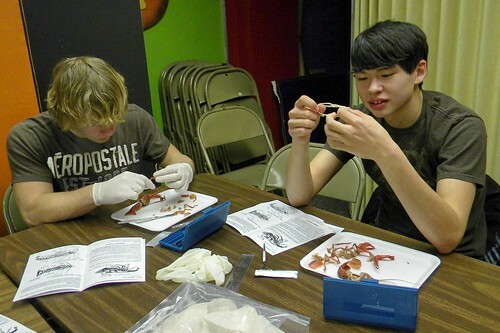 This time, Eric is dissecting a crayfish. Day 118: There’s snow on the ground, but the weather is warm and sunny. 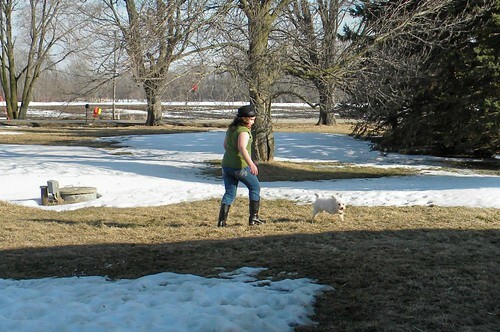 Janelle was able to play outside with her puppy without a coat. 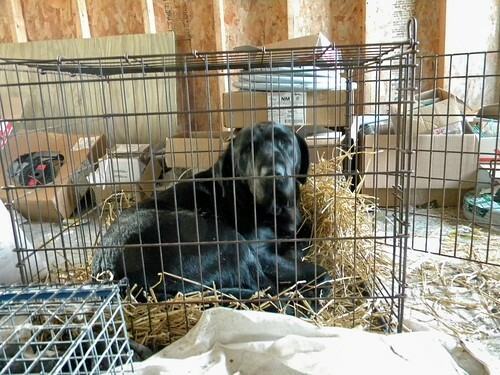 Day 119: Jet decided to climb into one of Greg’s chicken cages. 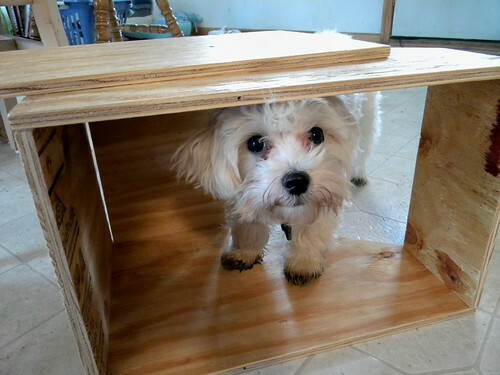 True, it used to be a dog cage, but I think he was looking for a chicken. The dogs love hanging out around the chicken coop. 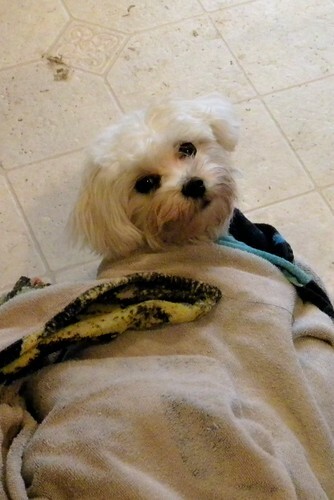 Day 120, March 17, 4 months done: Once again, Blizzard needed a bath. The mud on the floor by his head came into the house on his paws. Day 121: I worked on building a nesting box for a pregnant rabbit. Blizzard had to check out my construction job. 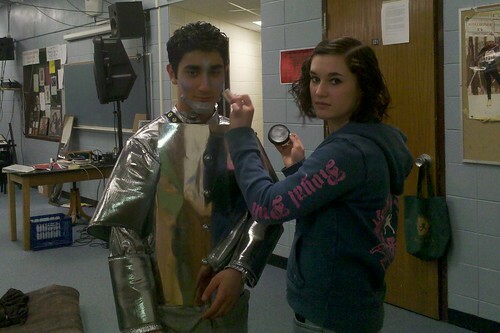 Day 122: Greg is getting his make up on so he can play Tinman for the dress rehearsal. Opening night is less than a week away. Day 123: The weekend meant going to another small animal swap meet. This one was primarily outside and it was cold and raining. The weather didn’t slow Greg down. 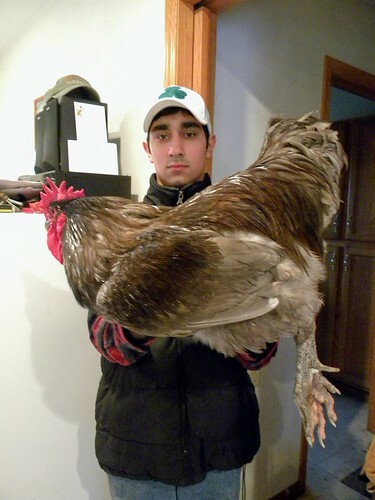 He came home with 19 new birds, including this Jersey Giant, who weighs about 15 pounds.